RUPES is internationally known as the leader in innovative technology and superior excellence. The RUPES BigFoot Backing Plates and Accessories are the finest quality available. 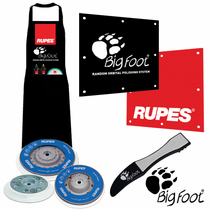 Official RUPES BigFoot Backing Plates, RUPES BigFoot Claw Pad Removal & Cleaning Tool, RUPES Apron, RUPES Shop Banners, RUPES Decals & MORE!